4th Of July: Happy Birthday USA! The 4th of July is a date that’s practically synonymous around the world for being the “birth date” so to speak of the United States of America. A little over 240 years ago The Declaration of Independence was made, and it’s always intriguing to learn how these things happen as not all countries needed to declare independence, and some – like ours – only just got there. Let’s turn to the internet of things for a little history lesson. 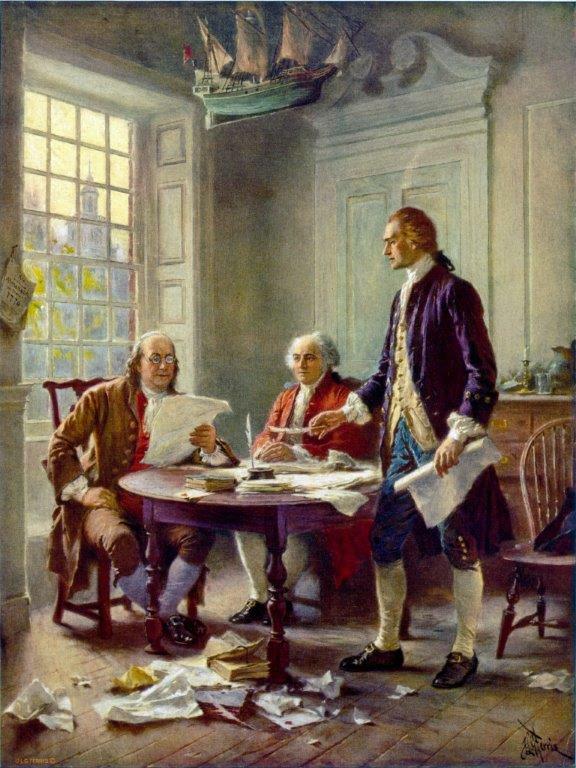 This idealized depiction was widely reprinted, of (left to right) Franklin, Adams, and Jefferson working on the Declaration (Jean Leon Gerome Ferris, 1900). During the American Revolution, the legal separation of the Thirteen Colonies from Great Britain in 1776 actually occurred on July 2, when the Second Continental Congress voted to approve a resolution of independence that had been proposed in June by Richard Henry Lee of Virginia declaring the United States independent from Great Britain rule. After voting for independence, Congress turned its attention to the Declaration of Independence, a statement explaining this decision, which had been prepared by a Committee of Five, with Thomas Jefferson as its principal author. The second day of July 1776, will be the most memorable epoch in the history of America. I am apt to believe that it will be celebrated by succeeding generations as the great anniversary festival. It ought to be commemorated as the day of deliverance, by solemn acts of devotion to God Almighty. It ought to be solemnized with pomp and parade, with shows, games, sports, guns, bells, bonfires, and illuminations, from one end of this continent to the other, from this time forward forever more. Fun Facts, no? History’s details often times get lost as the years go by, Today, however, is a day for celebration and all of us at The Lodge at Chaa Creek, Our founders The Fleming Family, Our Managers and all our staff would like to wish all our family, friends, guests, and fans both living in the USA and abroad a Happy, fun-filled 4th of July! Belize: Central American High Mountain Coffee Culture Arrives!